Nairobi, Kenya — Unlike Tanzania and Malawi, Kenya hasn't yet seen an explosion of HIV cases, and infection rates have held steady at an estimated 7 percent. But Kenya is still plagued by the stigma, fear and discrimination that accompany the virus throughout East Africa and much of the world. Mothers can lose their children to fearful in-laws. Some people refuse to speak to or touch their relatives living with the virus. HIV-positive women face a particularly high risk of isolation upon positive diagnosis. That's why Asunta Wagura and her companions founded KENWA, the Kenya Network for Women with AIDS. Wagura explains what happened after she discovered her status. "I faced a lot of rejection. I was thrown out from the medical school, and I was given six months to die," Wagura recalls. "When I reached home, my mother again called my brothers and sisters. I don't know what exactly she told them, but I could see from then on, nobody wanted to come near me, nobody wanted to talk to me. I was given a separate isolated room. I was given my own utensils, my plate, my spoon, my cup. Things were quite hard." Wagura's experience is all too common in areas stricken with HIV. Female infidelity is often assumed to be the cause of infection, both inside and outside of long-term relationships. "AIDS is like a women's disease, the way the stereotype is seen in the community," Wagura says. "The blame is placed on the woman. It is the woman who spread this disease." 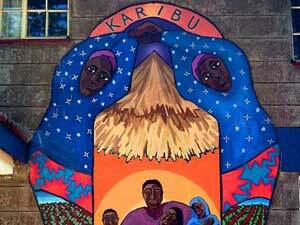 Kenyan women can find themselves scapegoats in the AIDS pandemic. But in Wagura's story, there's also hope. While she was waiting to die in her isolated room, Wagura realized that with the support of other women living with HIV, she could continue living a full life. She channeled her energy into KENWA, which now supports thousands of women and children across the country. People with HIV across East Africa struggle to live a hopeful life, some without access to much medical care and in the face of devastating isolation. Antiretroviral drug therapies, or ARVs, are helping to stoke that flickering sense of hope. ARVs shut down the virus and have saved countless lives. In developed countries, they've turned HIV into a chronic rather than fatal illness. Although ARV drugs are still not available to most of the population of sub-Saharan Africa, there are a lucky few. Nairobi is Kenya's sprawling capital city of three million. Nearly one million live in Kibera, a slum that snakes in and out of a ravine on the western side of the city. The conditions in Kibera are as bad as anywhere in the world. Refuse lines the narrow alleys and collects at the edges of the steep valley. Open streams of sewage trickle past the stoops of tiny metal shacks. For those born into this squalor, options are few. And for a child born with HIV, there is little chance of survival, even less if they're orphaned. Once literally left for dead, a fortunate handful of orphans living with HIV today have a home. In the Nairobi suburb of Karen, behind lush bougainvillea-lined walls, there is a refuge for orphaned children living with HIV. It's called Nyumbani, which, in Swahili, means "home." Since 1992, Nyumbani has provided a place where these children can receive desperately needed medical treatment, along with the care and love that children deserve. Sister Mary Owens has been a senior Nyumbani official since its inception. "Sometimes we would hear, 'Why bother about HIV positive children? They're going to die anyway. Prevention is more important,'" Sister Owens says. "Then, 'Today, the way is care in the community. And here are you, trying to start a home for children, to institutionalize them.' Now, I'd say that institutionalization is the last adjective you'd use about Nyumbani." Antiretroviral drugs have allowed these children to live longer and happier lives than ever before. Orphans who used to struggle with their health now run laughing through Nyumbani's gardens and manicured playgrounds. Sister Mary Owens says Nyumbani has changed. "We give them life, and life is hope. We had three to five deaths a month at the very beginning. We have 56 children who have passed on," she says. "But since we started the ARVs back in '98, and gradually placed all those children who needed to be on ARVs on them, we have maybe one death a year, or sometimes none. In 2003 there was no death. So there's hope." One of the activities at Nyumbani is the choir known as Watoto wa Mungu, or Children of God. John Mwiro is a member of the choir, and a Nyumbani resident for nearly all of his 13 years. "The first day I came here at Nyumbani, I was very sick, very seriously sick. But after some few months, I started taking the ARVS, and I'm better now," says Mwiro. "My health is good. I fall sick sometimes. I eat well, take the ARVs, have a lot of exercise, and leave everything else to God." The Watoto wa Mungu choir is not only an important Nyumbani project -- it's become a hit across the country and vaulted the plight of HIV-positive orphans onto Kenya's cultural mainstage. A team of producers donated time to making the album entitled "See The Light," and Watoto wa Mungu's recording shot to the top of the Kenyan charts, with one single staying at No. 1 for a record five weeks straight. "We have all these fans who are willing to hug them, and before that, there were people who were visiting here wearing gloves just to visit Nyumbani," says Don Rawzi, executive producer of the album. "You can imagine the kind of stigmatization those kids faced, when they see someone who's visiting here and they're wearing gloves." Rawzi says participation in the choir has had a profound effect on the well-being of its members. "One of the kids was sick from the music group. She knows that the group will be going out, she tries her best to feel well. It's like a healing process. I could say music has medicinal values," Rawzi says. The children of Nyumbani have found a way to show their country how to live with AIDS. But these are the lucky few. One estimate is that more than 100,000 Kenyan children are living with HIV, and less than 5 percent of those have access to treatment. Sister Mary Owens says she won't stand for it. "This is the big injustice of our world, that there is medicine available and it's not available here in sub-Saharan Africa, where the greatest number of HIV positive persons are," Owens says. "There's no place like Nyumbani"
"You see our children here. They're all healthy. Most, there are 62 out of the 94 are on ARVs. And that's why they're healthy, those 62. They're living full lives," says Owens. "They've hope for the future, they're like normal children -- planning, dreaming what they would like to do after they finish school. So that's the hope, the positive face of AIDS, and that's possible for every person who's infected." At a celebration of Nyumbani's 12th anniversary in 2004, the guest list ranged from international volunteers to the first lady of Kenya. Speakers mentioned the incredible success of Nyumbani, and the ways that the organization has touched the entire nation of Kenya. The most powerful presentation, though, came from the children themselves. Inspired by an old story of finding one's way home, the Nyumbani residents performed an adaptation of "The Wizard of Oz." Tiny children dressed with paper flowers wrapped around their heads made up the scenery. Dorothy's shoes were an old pair of red slippers. And as she clicked her heels, she proclaimed, "There's no place like Nyumbani."